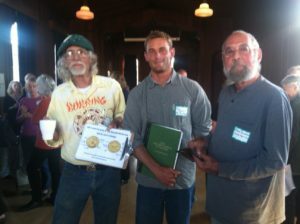 The West Marin Fund hosted its 7th ConFab on March 25th, at the Dance Palace Community Center in Point Reyes Station. 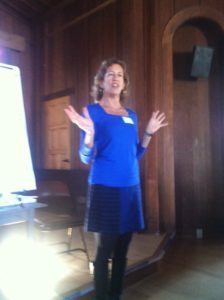 Participants came from up and down coastal Marin, and enjoyed a terrific tutorial from Ann Shulman of Philanthropy Associates — on building capacity, and Getting Our Act (further) Together. She led an interactive session on Decision Making that had people saying “I’ll use lessons from that tomorrow and every day thereafter”, and “Our board is ripe for that teaching, right now.” With real tools to take away, it was a perfect short session that preceded updates on some key activities in our region. 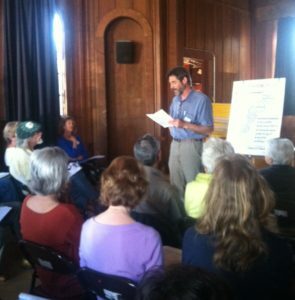 This ConFab also presented 4 West Marin Updates, by people doing work we all should know about. Steve Siegel of Coastal Health Alliance on advances in serving their 6000 clients. Kim Thompson of our local land trust, CLAM, on the Coast Guard Station’s promising potential to be affordable housing. 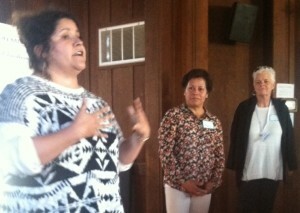 Maria Niggle, Socorro Romo and Bonny White on impressive and welcome progress in our Latino Engagement efforts. Julie Cassel on a pilot project Giving Through Youth, where students will decide where to grant $1000 to a local non-profit. Inspired donor Richard Kirschman offered up another $1000 for each of the 2 classrooms in the project — making his gift total $4000 and inspire others to join in. Ann Shulman of Philanthropy Associates led a concise skill-building exercise on Decision Making… harder than we think! Coastal Health Alliance’s Steve Siegel talked about the services it provides over 6000 clients in its 3 clinics. No longer asking “what’s the matter with you?” but “what matters to you?” is shifting the focus of health care to preventive strategies with high levels of compliance — and healthier clients. 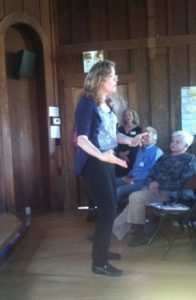 Kim Thompson of CLAM offered an update on the Point Reyes Coast Guard Station’s potential to become affordable housing. It’s a project with wide community support, and now needs political support to get turned over to the County, and then to CLAM and its development partners, to become reality. Latino Engagement is emerging as one of our proudest community activities: The Fund is part of a collaborative effort to invite, train and welcome Latino leadership in our communities. Maria Niggle of the West Marin Collaborative, Socorro Romo of West Marin Community Services, and Bonny White of the Point Reyes Library gave an update on recent activities that was both heartwarming and promising. Maria Niggle, Socorro Romo and Bonny White describe impressive new Latino Engagement efforts. Julie Cassel, 8th grade teacher at West Marin School, introduced our new pilot project Giving Through Youth. Her students are exploring community needs and will identify non-profits that would address that need. Then they’ll write a proposal to West Marin Fund for $1000. to give to a non-profit for its work. Donor/idea-generator Richard Kirschman stood and offered to support TWO classrooms at $2000. each … a great boost to students who find this project “Awesome!!”. Colin Williams of Nicasio School will lead his classroom of 6th, 7th and 8th graders in a parallel project. We can’t wait to report on their decisions. Young philanthropists of West Marin! New donors are invited for our next round in Autumn of 2015.